www.rockproducts.com ROCK products • November 2018 • 65 ECONOMICS factory in Inola, Okla., and a $175 mil- lion ethane cracker plant in Carlyss, La. 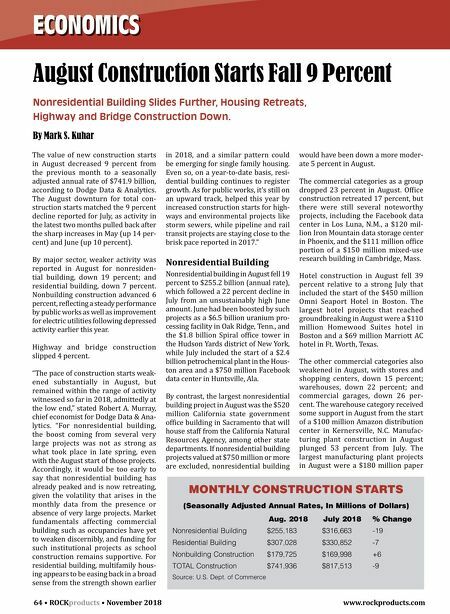 The institutional side of nonresidential building slipped 6 percent in August. The transportation terminal category dropped 63 percent after being lifted in July by the start of the $650 million main terminal upgrade at Denver Interna- tional Airport and a $268 million project at Nashville International Airport. Decreased activity was also reported for religious buildings, down 8 per- cent; and public buildings (detention facilities and courthouses), down 29 percent. 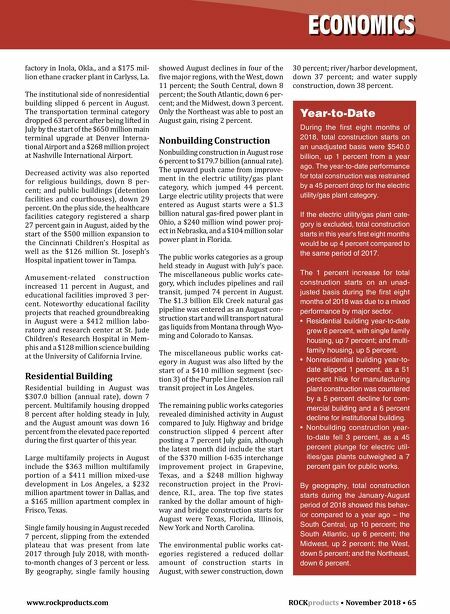 On the plus side, the healthcare facilities category registered a sharp 27 percent gain in August, aided by the start of the $500 million expansion to the Cincinnati Children's Hospital as well as the $126 million St. Joseph's Hospital inpatient tower in Tampa. Amusement-related construction increased 11 percent in August, and educational facilities improved 3 per- cent. Noteworthy educational facility projects that reached groundbreaking in August were a $412 million labo- ratory and research center at St. Jude Children's Research Hospital in Mem- phis and a $128 million science building at the University of California Irvine. Residential Building Residential building in August was $307.0 billion (annual rate), down 7 percent. Multifamily housing dropped 8 percent after holding steady in July, and the August amount was down 16 percent from the elevated pace reported during the first quarter of this year. Large multifamily projects in August include the $363 million multifamily portion of a $411 million mixed-use development in Los Angeles, a $232 million apartment tower in Dallas, and a $165 million apartment complex in Frisco, Texas. Single family housing in August receded 7 percent, slipping from the extended plateau that was present from late 2017 through July 2018, with month- to-month changes of 3 percent or less. By geography, single family housing showed August declines in four of the five major regions, with the West, down 11 percent; the South Central, down 8 percent; the South Atlantic, down 6 per- cent; and the Midwest, down 3 percent. Only the Northeast was able to post an August gain, rising 2 percent. Nonbuilding Construction Nonbuilding construction in August rose 6 percent to $179.7 billion (annual rate). The upward push came from improve- ment in the electric utility/gas plant category, which jumped 44 percent. Large electric utility projects that were entered as August starts were a $1.3 billion natural gas-fired power plant in Ohio, a $240 million wind power proj- ect in Nebraska, and a $104 million solar power plant in Florida. The public works categories as a group held steady in August with July's pace. The miscellaneous public works cate- gory, which includes pipelines and rail transit, jumped 74 percent in August. The $1.3 billion Elk Creek natural gas pipeline was entered as an August con- struction start and will transport natural gas liquids from Montana through Wyo- ming and Colorado to Kansas. The miscellaneous public works cat- egory in August was also lifted by the start of a $410 million segment (sec- tion 3) of the Purple Line Extension rail transit project in Los Angeles. The remaining public works categories revealed diminished activity in August compared to July. Highway and bridge construction slipped 4 percent after posting a 7 percent July gain, although the latest month did include the start of the $370 million I-635 interchange improvement project in Grapevine, Texas, and a $248 million highway reconstruction project in the Provi- dence, R.I., area. The top five states ranked by the dollar amount of high- way and bridge construction starts for August were Texas, Florida, Illinois, New York and North Carolina. The environmental public works cat- egories registered a reduced dollar amount of construction starts in August, with sewer construction, down 30 percent; river/harbor development, down 37 percent; and water supply construction, down 38 percent. Year-to-Date During the first eight months of 2018, total construction starts on an unadjusted basis were $540.0 billion, up 1 percent from a year ago. The year-to-date performance for total construction was restrained by a 45 percent drop for the electric utility/gas plant category. If the electric utility/gas plant cate- gory is excluded, total construction starts in this year's first eight months would be up 4 percent compared to the same period of 2017. The 1 percent increase for total construction starts on an unad- justed basis during the first eight months of 2018 was due to a mixed performance by major sector. • Residential building year-to-date grew 6 percent, with single family housing, up 7 percent; and multi- family housing, up 5 percent. • Nonresidential building year-to- date slipped 1 percent, as a 51 percent hike for manufacturing plant construction was countered by a 5 percent decline for com- mercial building and a 6 percent decline for institutional building. • Nonbuilding construction year- to-date fell 3 percent, as a 45 percent plunge for electric util- ities/gas plants outweighed a 7 percent gain for public works. By geography, total construction starts during the January-August period of 2018 showed this behav- ior compared to a year ago – the South Central, up 10 percent; the South Atlantic, up 6 percent; the Midwest, up 2 percent; the West, down 5 percent; and the Northeast, down 6 percent.